The self-contained Eco-cabin can easily accommodate up to 10 people and there is also room for tent camping nearby. 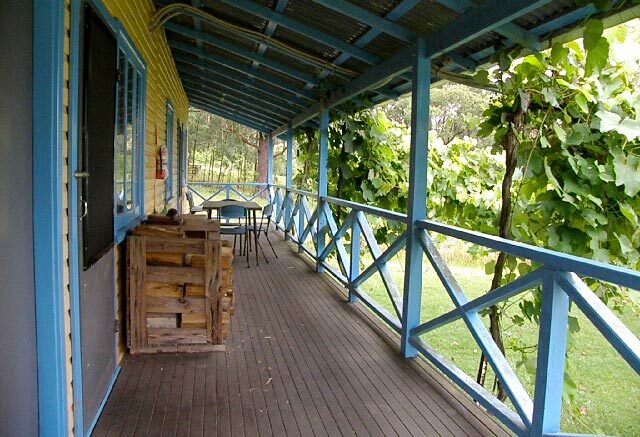 Callicoma Hill Eco-cabin is located on the south-western edge of the Barrington Tops, only 3 hours from Sydney, 2 hours from Newcastle and approximately 1 hour from the Hunter Valley vineyards. The nearest town is Singleton, 50 km to the south. Picturesque Lake St Clair is about 15 minutes drive away, and offers fishing and boating opportunities. Callicoma Eco-cabin has 3 separate bedrooms, a fully equipped kitchen, lounge/dining room and bathroom. 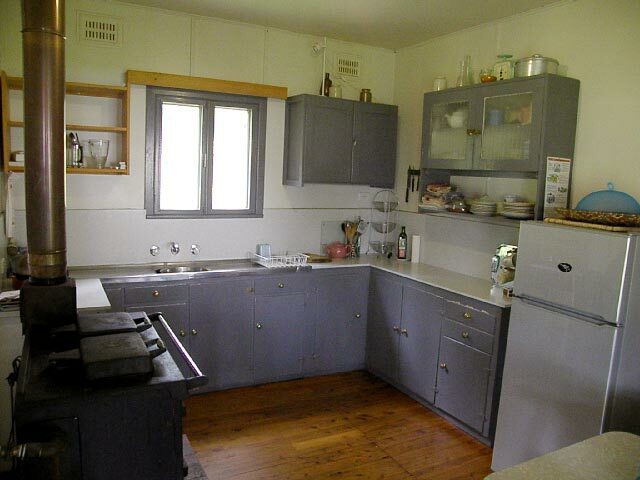 The kitchen features a traditional wood fuel stove and oven. A gas ring is also available, plus an outdoor wood barbecue (dependent on weather and fire restrictions). The kitchen has a fridge with a small freezer. There is no microwave oven, dishwasher, coffee machine or other energy-intensive appliances. All crockery, utensils and cooking equipment are provided. 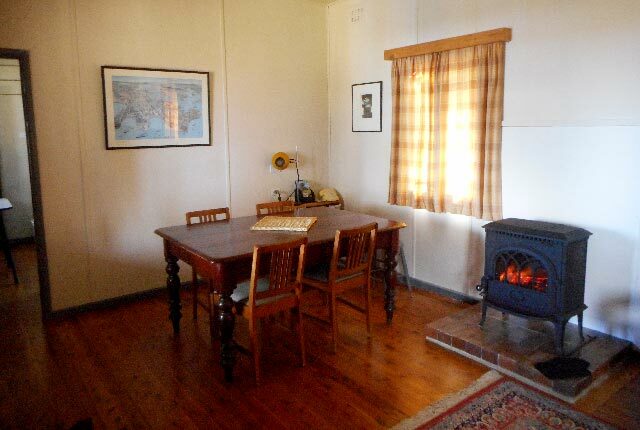 A cosy wood heater is in the lounge for chilly winter nights. The kitchen stove also heats the kitchen, and provides the hot water for both the kitchen & bathroom. There is no heating in the bedrooms. The bathroom has a flush toilet and shower. Bring your own bed linen and towels. Everything else is provided, including pillows, doonas, blankets, hot water bottles and tea towels. There is no WiFi or TV. There is no wheelchair access. Smoking is outside only. There is no air conditioning. In summer, cooling is provided by the cross-ventilation from the windows around the cabins. We also have a desk fan. Also, the cool mountain breeze arrives each evening! Many environmental features have been incorporated into the design of Callicoma Hill Eco-cabin to make it a showcase of ecologically sustainable development, and it is accredited by Ecotourism Australia. Special features are the fully independent solar electricity supply & minimal electricity usage, and rainwater tanks that provide pure drinking water. Wood from the property is used for cooking, heating and hot water. Waste water is treated in constructed wetlands. There is ample verandah space for outdoor relaxing and dining – with a 70km view! Callicoma Hill is a wildlife refuge, and home to a range of native animals including threatened species. 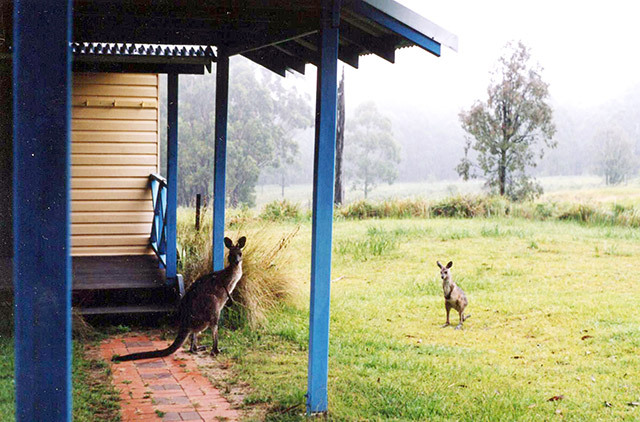 Kangaroos and wallabies regularly graze near the cabins, and birdsong surrounds you. We do not feed any of our native animals or birds. Guests are not able to bring domestic pets. 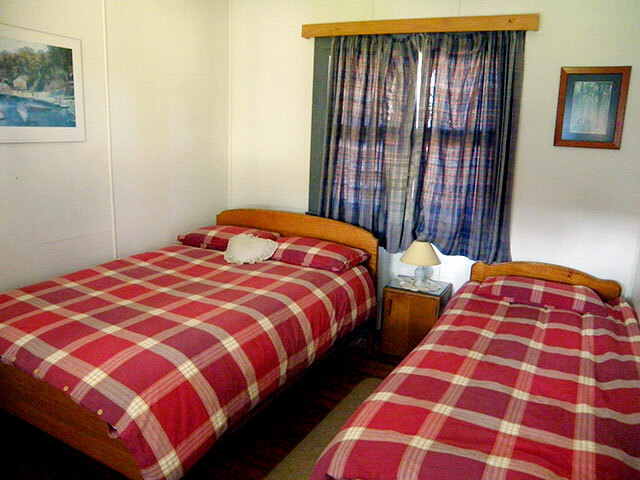 Callicoma Hill also provides Bunkhouse accommodation and camping facilities nearby. Minimum booking $320* (covers 2 adults for 2 or 3 nights). Additional adults $45 per person per night and children $30 per person per night with max 10 people. Linen (if required) $15 extra per person. We book only one group at a time for the eco-cabin and for the bunkhouse/camping area. The whole property (bunkhouse, bush camping and eco-cabin) is available for the exclusive use of large groups and functions including weddings and family events. Contact us for a quote and to discuss your requirements. I am impressed not only with the ongoing energy evident at Callicoma Hill, but with the thoroughness of the research and planning and the totality of the commitment to and practice of environmental responsibility - Sharyn Munro, Owner Builder Magazine. QWhat types of guests is the Callicoma Hill Eco-cabin suitable for? The Eco-cabin can accommodate couples, families, groups of friends or a number of families. It is excellent for children who wish to camp while parents stay in a room. 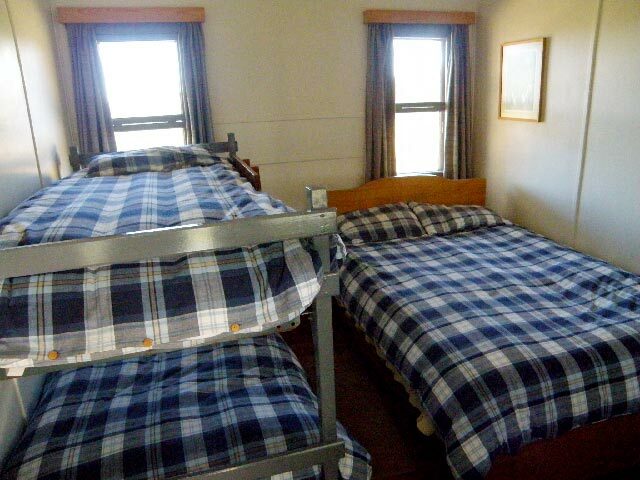 It is possible to hire both the Eco-cabin and the nearby bunkhouse area for larger groups. The Eco-cabin is ideal for artists, writers, thinkers and photographers who need quiet time and space. QHow many people can the 3 bedrooms accommodate? 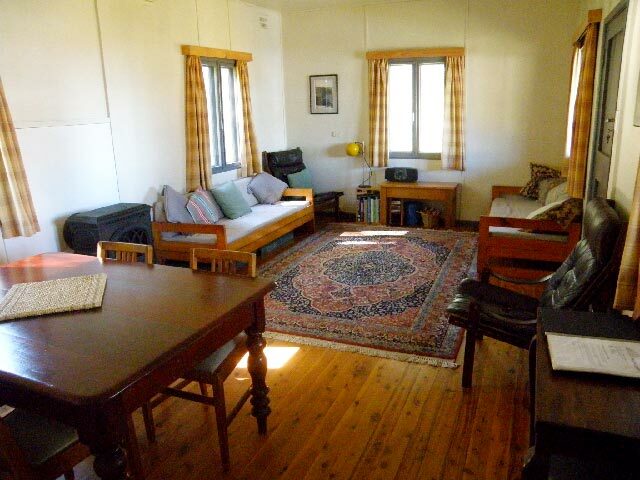 The bedrooms can accommodate up to 9 people, and two bedrooms have double beds. 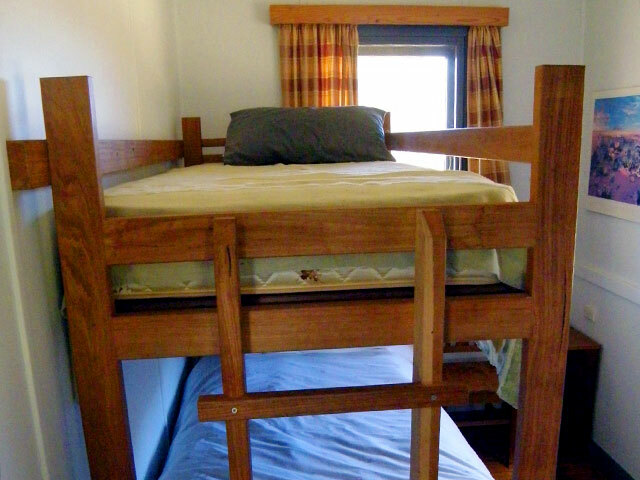 There are two bunk beds. See the plan of the cabin layout. QWhat do I need to bring? Guests need to bring their own bed linen and towels. Everything else is provided, including pillows, doonas, blankets, and tea towels. Please bring warm clothes for cool evenings, especially in winter. Note that bedrooms are unheated. More frequent rain and mist occurs in the mountains, so it is useful to bring a raincoat and suitable shoes and a torch for use at night. QDo I need to cook on a wood stove? Cooking in the cabin kitchen is on a wood stove, which also provides hot water. The wood stove is excellent for cooking and instructions are provided on how to use it. However, it needs around 1 hour to heat up for cooking. Well seasoned firewood for the stove is sourced from our own property. There is also a simple gas ring for heating up water for a quick cuppa. QWhy is it described as an ‘Eco-cabin’? The cabin was specifically designed and located with the environment in mind. The building minimises the use of electricity, water and materials, with a focus on durable building materials and appliances. All energy (electricity and wood) to operate the cabin comes from the site and rainwater is collected, used and disposed of without use of pumps by gravity flow. Organic waste is composted and wastewater is treated and managed on site. Ready for your Callicoma Hill Eco-cabin, Mount Royal Bunkhouse or Camping stay?